Pleasant View Care Home is easy to miss if you’re not looking for it — a long, low building tucked behind a stand of trees on the outskirts of Mission, labeled with a simple wooden sign. Through a set of double doors are wide halls painted in warm colours, where seniors sit in chairs chatting, sleeping, and reading. The date and the day of the week are posted in bright letters on the wall, for those who can’t remember. Next to it hangs a whiteboard schedule of activities and programs for the day. One of the programs that ran at Pleasant View this past spring was not only a project for seniors, but also for several students and faculty members from the Nursing, Kinesiology, and Media and Communication Studies (MACS) departments at UFV. Over the course of 16 weeks, the interdisciplinary research team studied a program titled “In the company of elders,” which paired 15 seniors from the home with half a dozen school girls between the ages of seven and ten. Together, the seniors and the girls learned ballet from Lee Kwidzinski, who teaches dance in the Fraser Valley with a variety of programs. 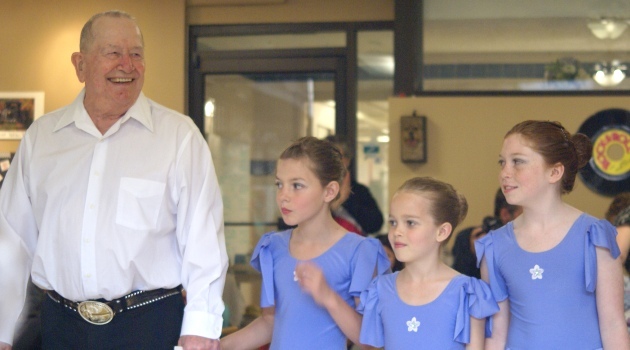 Seeing the collaboration between young dancers and seniors started wheels turning in Canning’s head. She and Michael Gaetz, a member of UFV’s Kinesiology department, were in the process of studying cognitive function in elders and how that changed or improved with regular physical exercises and activities. The idea of studying a partnership like the one Kwidzinski had created between seniors and children seemed like the natural evolution of that research. They soon discovered there was more to the project than data. The final piece of the project became a documentary team headed by Darren Blakeborough, a MACS professor, which consisted of five MACS students and several volunteers. Canning says that the program created the perfect vehicle for the children and seniors to interact. At the program’s year-end recital on June 16, the girls gave each senior a rose — a customary post-performance gift for dancers. Likewise, the seniors presented the girls with a card that they had created and signed. By the end of the afternoon, tissues were being surreptitiously shared between audience members for those who began to tear up. “I’ve been working with this demographic for a long time, but you’re still moved when you see real life. There’s no pretention, there’s no plan, there’s no ego,” Canning explains. “And the kids are so genuine. They have that sense that they’re needed, and that the seniors need them. The program is now finished for the year, but the work is only just starting for the research team; the documentary crew has over 400 hours of footage to edit, and Canning says that her team has the equivalent volume in field notes and observations. Both Canning and Blakeborough hope to see the dance program continue next year. Both Canning and Blakeborough are quick to mention the support the program received from all sides: UFV supported the project from the very beginning in a myriad of ways, and also received unrelenting support from the Pleasant View Care Home administration and staff, the Mission school board, and ES Richards Elementary school administration and teachers. Faced with 400 hours of footage now that the documentary is done, Blakeborough admits he feels a little lost. You can see a full flickr gallery of the final recital here.